She was sitting on my knee, studying my face as only a toddler can. Wha's that, Gramma?" She pointed. "My chin," I said helpfully. "No, Gramma . . . that!" She pointed again. "Oh, that's a scar, sweetheart." She touched it. "Owww!" she said. "It doesn't hurt, sweetheart. It's old. Like Gramma." "Gramma got it from a cow." She stared at me. Skepticism writ large in the two-year-old expression. No way the gentle cows from the books we read could ever have given Gramma the two-inch scar she sported across her chin. "Yep. A cow," I repeated. So, for my granddaughter, and those who haven't heard the story, a repost . . . I never used a saddle. Tacking up was amazingly easier. Riding much more natural. And no stirrups to get in the way. But it afforded other . . . complications. For one thing you could never use a rope. Chasing down and securing a calf presented . . . certain challenges. But . . . Adapt. Adopt. Become adept. The theme song of ranch life. I simply rode up beside them and leaned off to one side, catching said calf by the tail. Then I slid off on top of him. Or her. Until I met Cow 175. But I am getting ahead of myself . . . The day started out much as any other. I was 'riding herd'. Checking to see if anyone had calved, or needed help in doing so. I came across a small, obviously newborn calf hidden in the tall grass. I should explain that a new cow mother will instruct her new calf to lie quietly until she returns. I don't know how they do this. But they do. The new little calves will simply lie there while you vaccinate them and check them over. But the final step, the one where the calf is officially identified and tagged to match mama, is the trickiest. Because this requires the attendance of said mama. Imagine trying to pick out the mama when all the cows and calves . . . look the same. I found that the best way was to straddle the calf and make 'distressed baby' noises. Guaranteed to encourage any mama to come on the run. 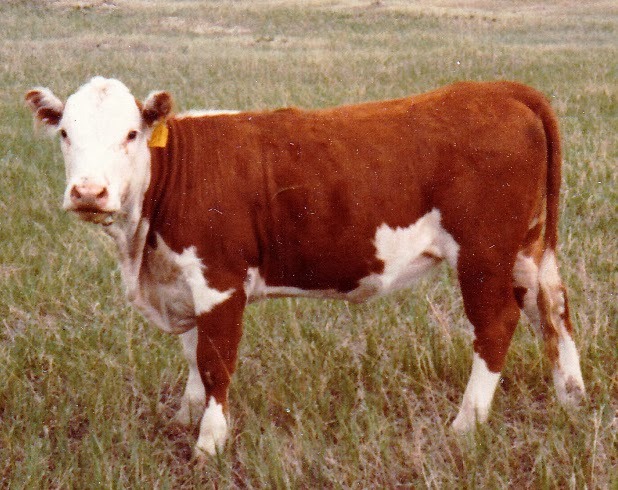 Now I should mention here that my Dad raised Polled Herefords. The breed known for their gentle dispositions. Oh, and also a breed that has no horns. Thus the word 'polled'. They don’t need them. Let's just say that if they had them, my scar would look a whole lot different. And this story would have had a vastly different ending. See that 'poll' on her head, between her ears? 175 hit me with the pointy part of her head. The part between her ears made entirely of bone. Really hard bone. I saw stars and quite a bit of the prairie as I left the calf. The culprit and her offspring wasted no time in vacating the area. I got to my feet and stared after them, fuzzily. I had lost my glasses in the encounter. But that didn’t even slow me down. I piled back onto my horse and started after the two, quickly nabbing the calf once more. This time, I took the precaution of dragging it beneath my horse. 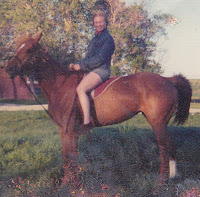 Something else you should know is that throughout my years on the ranch, I was known for riding really . . . ummm . . . green horses. Usually radically unsuited to ranch life. GollyGee, my mount of the moment was totally in keeping with this reputation. She was an ex-racehorse. Tall, lean, fast, and really . . . un-smart. Usually, a person walking anywhere near her would have sent her, by the most direct route, to the moon. And a person dragging something toward her? To Jupiter. Perhaps the anger radiating off me - in waves - had a stupefying effect. Perhaps she was merely trying something new. Self preservation. Whichever. She stood like a rock as I dragged the 50 pounds of protesting red and white calf beneath her. Now most cows are afraid of horses. Fortunately for me, this particular cow was only over-protective, not suicidal. She did laps while I injected and tagged her calf. Then I stood up, releasing the baby, but before it could regain its feet and rejoin its mama, I walked over and booted her. Twice. I don't know what it did for her, but it made me feel good. Then I watched as the two of them headed for some human-less spot. Riding back to the scene of the crime, I searched around until I finally discovered my glasses. Miraculously undamaged. Then I rode home and stabled my horse. And here is where the story really gets interesting . . .
My Mom was the daughter of a rancher. 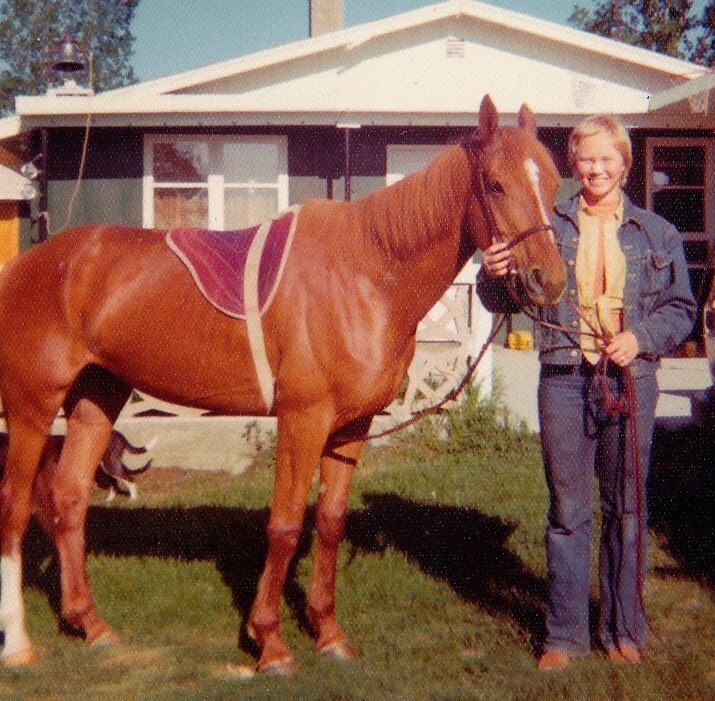 Her years of ranching experience were many and varied. But she could still be shocked. When I walked in the kitchen door, she screamed. And ran for a towel. It was only then that I realized that I could feel the tip of my tongue. And that my shirt was completely covered in blood. Huh. How did I miss that?! 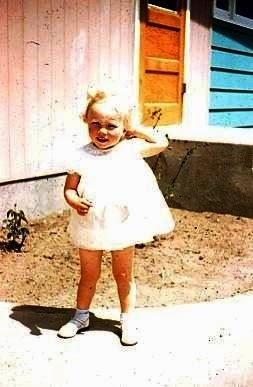 Occasionally, when Mom got tired of driving twenty miles of dirt roads for everything, my parents would move the family to our town house. The one . . . umm . . . in town. It was a whole different lifestyle for me. I had a tricycle. A hand-me-down from three siblings before me. With a little plastic tassel hanging from one handle grip that waved in the breeze when I went really, really fast. I was the master of the universe! As long as I stayed on the sidewalk. The streets around our block were 'dangerous'. Okay, so Mom described the dangers as speeding cars that would flatten me into a pancake, but I put my own spin on it. So, back on the tricycle. Doing laps of our block. The different homes there were categorized according to points of interest and/or what foodstuffs could be procured on the premises. Lodemier's house, where the baloney sandwich ruled supreme at snack time, and where best friend, Laurie, lived. Reese's house, where good cookies could be found at any time. Madge's house, another food emporium. Winter's house, with the cute, fuzzy Pomeranians. And so on. I'm not sure what they thought when Diane pulled onto their driveway on her trusty steed. At least they were kind. All of this is just my long-winded way of saying there was nothing more interesting than the homes on our block. Why would anyone venture out onto dragon-infested gravel street in search of anything else? It just didn't make sense. So I stayed on my sidewalk. And was safe . . . There was an alley running the length of our block. The back yard of every home opened onto it. It was a hive of activity every day as dozens of children ran and played. Occasionally, it was used for vehicles. Our neighbour, especially, was known to park his huge grain truck there during harvest, to keep the behemoth (real word) off the street. And that simple act diminished the safety margin by a factor of 100. I don't know what that means, but it sounds . . . unsafe. On this particular afternoon, our neighbour had come into town from his farm for lunch. Having finished said lunch, he had strolled back out to his truck to return to work. I had also recently finished my lunch. And was on my way to his house for a much-needed cookie fix. For a short while, the two of us occupied the same general space. But his vehicle was vastly superior to mine. Okay, well, it was bigger. I was just crossing the entrance to the alley, safely staying on my sidewalk as he was backing his truck up. I should mention here that trucks in those days didn't have warning beepers or rear-view cameras. In fact, they barely had mirrors. Needless to say, my neighbour didn't see me. And stared, transfixed at the enormous blue box of the truck backing, slowly but steadily, towards me. Huh. Something whispered that maybe I should get off my tricycle and move to the side. 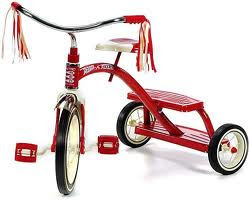 There was a tiny crunching sound as it ran over my tricycle, folding it in two. Huh. There's something you don't see every day. The driver kept backing, oblivious to what had just happened. He waved at me cheerfully as he went past. Then, reaching the street, he reversed direction and headed out. Then looked at my tricycle. Or the little mashed-together bits of metal that used to be my tricycle. Dad did fix it. And it looked even better when he was through. And two little tassells instead of one. And I think he made it a little bigger. Soon I was back on the sidewalk again. And yes, that is a band aid on my nose. I learned two things that summer. 1. Barbed wire gates are tricky. 2. Some young gentlemen, though they look strong, aren't. Oh, and . . . I was herdsman for my Dad. Had been for two years. It was a simple job, now that calving season was pretty much over. My duties consisted of making sure that all four-footed red and white creatures were safe and happy. Much like a mother hen. The only difficulty lay in the fact that all summer, there had been gangs of young men between the ranch buildings and the field. Okay, groups of young men weren't a normal - or necessarily unwelcome - sight in our part of the country. And these were seismic crews in groups of ten or so who were more-or-less busy laying out lines and setting the charges that would indicate hidden reserves of oil. So, riding past them wasn't a difficulty, really. But I did feel rather . . . conspicuous. Particularly if they weren't busy at the moment and had nothing, other than me, to watch. On this particular day, in full view of about ten pairs of eyes, I slid off my horse and effortlessly opened the gate. I smiled, then hurriedly pulled my horse through and closed the gate. I wasted no time in heading to the far side of the field, hoping that, when I was done, they would have moved a little further down the road. By the time I finished my sweep, they had finished their work and were standing around, just outside the gate, waiting for their data to be collected. And with nothing to do but watch me. I dismounted and opened the gate. Again, the cynosure (real word) of all eyes. I led my horse through. One of the young men, obviously a gentleman, had stepped forward. I handed him the post and stepped back. He stuck the post into the bottom loop, then pushed it upright. It didn't come anywhere near the all-important top loop. I should point out here that a barbed wire gate is held shut by two loops of wire - one top and one bottom - on the lead post. If the bottom loop isn't high enough on said post, the gate is increasingly harder to fasten. The young man had obviously seen me open the gate. With the swat of one hand. His manhood was now on the line. He pushed, while trying not to appear that he was pushing. He began to get red-faced. He put his shoulder to the post and pushed some more. Still a gap of two or three inches. A mile in 'gate' terms. I suggested that he push the bottom loop a little higher on the post. And was still an inch out. He had offered to help me. I couldn't bear to stand there and witness his embarrassment. And gave him my biggest smile. Then I jumped on my horse and made a quick exit. A short time later, when the crew had moved on, I went back and checked the gate. I don't know if the poor man did it himself, or if half the crew had to help him. At least I wasn't around to witness it. But I will always be grateful. He was a true gentlemen. And even a cowgirl appreciates that. Swimsuit? Or underwear. You decide. The girl whose family owned the only swimming pool in the town was hosting an impromptu pool party with her friends. One girl came without a swimsuit. She then waved, vaguely, before turning back to her other guests. The guest disappeared, returning a short time later dressed in a modest blue two-piece. Tossing out greetings to the young men and women clustered around the pool, she sauntered around to where her hostess was sitting. Her hostess looked up, then shrieked and jumped to her feet. “Where did you get that? !” she said. The guest blinked and glanced around nervously. All eyes were on her. “Eeeeeeee!” the guest sprinted back into the house. In what could easily be mistaken for a swimsuit. But just being told she was wearing underwear made her scramble madly for shelter. I thought this cartoon was hilarious. Then, I saw it happen to my Mom. Well . . . something similar, anyways . . .
Our family was getting ready for church. My current boyfriend, coming to church with my family for the first time and dressed uncomfortably in a shirt and tie, was seated in the great room, waiting for the rest of us. I was the next to be ready, so I sat beside him and started talking. My mother scurried out of her bedroom and started puttering around in the kitchen, in plain sight of the two of us. She put a roast in the oven for dinner and then started tidying up from breakfast. But for some reason, my boyfirend woudn't look at me, but stared, instead, out the window. He kept staring fixedly (good word) at something outside. As she was making a fast exit towards her bedroom. At first I saw nothing wrong. She was dressed in her usual fashion. Undershirt, bra, full slip. Oh. Wait. Something was missing. Suddenly my boyfriend's fixed gaze made sense. He had noticed as soon as Mom had entered the room. Huh. Funny that I didn't see it. Okay, so observant, I'm not. Mom went through the rest of the day rather pink-faced. She had been completely covered. In at least three layers of cloth. But because the material had been termed 'underwear', she was embarrassed. As I would have been. As anyone . . . you get the point. Labels: "Oh my! Look at me!" Five months pregnant with my sixth baby. And playing center for my women’s basketball team in a winter tournament. We had won both of our games, positioning ourselves for the semi-final the next day. My slightly pudgy self had even managed a break-away and lay-up. Only one, but hey . . .! And in a euphoric haze, Husby and I were heading over to an activity at the church. Where we’d be playing volleyball. My team scored a point. I leaped into the air, kicking one leg and punching both hands upward in triumph. Huh. Somehow, unbeknownst to me, both of my legs had kicked out. I fell heavily on my right hand. Back on my feet, I continued to play. Went up for a spike. And realized that something was definitely wrong. Hands aren’t supposed to hurt like that. Long story short, A quick trip to emergency confirmed my suspicions. Not only had I broken the bottom right off the bone, but my continued playing had then crushed the broken-off piece. I won’t describe the process to get everything back where it should be, or the needle from hell. Suffice it to say, because of an excellent doctor, I was soon on the mend. 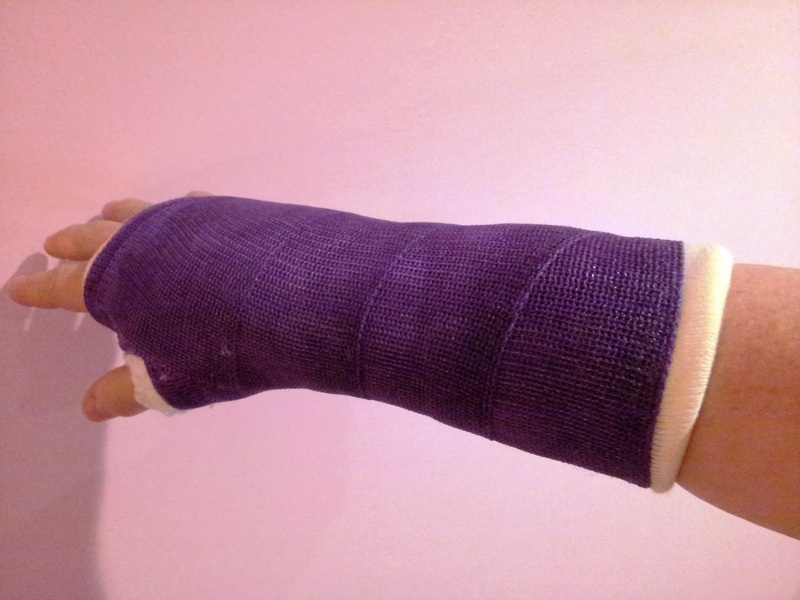 Six weeks in a cast. Moving forward to yesterday . . .
My daughter and I had decided to go snowboarding. I’m always up for something new. She had just started and loved it! It had been warm and snowless for a number of weeks and the only powder was what had been ground up by the resort’s grooming machines. I stayed prudently on the bunny hill with several dozen little kids. Had, after three tries, mastered the rope tow. I was king of the mountain! Down the slope in an ever-increasing need for speed. Okay, you have to know that the speed I was needing was just slightly faster than a walk. We decided on one last run. And an all-too-familiar ‘weak’ feeling in my right wrist. It’s been 26 years, less four days. I’m back in the cast again . . . The nose is okay. The teeth . . . Okay, yes, I had been told never to do it. In fact, I had been threatened with certain death punishment if I did do it. But it was my favourite indoor thing to do! 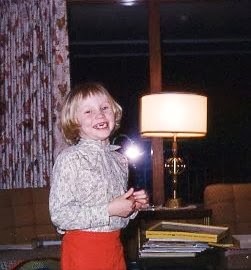 I was four. I admit it, my world was small. My family was living in the ranch house on the Stringam ranch. I had my own room on the ground floor. I had recently graduated from my little ‘kitty’ bed to my own giant, iron bed. My giant, iron bouncy bed. During the night, bouncy iron beds are good for sleeping. During the day, they make perfect trampolines. Yeah. My mom didn’t get it, either. She would come into my room. Probably the part where she ‘left’ was her biggest mistake. There was this remarkably smooth surface. It was a no-brainer. Literally. Then, graduating to my feet. Oh, you can really catch air when you use all of you! Man, that woman could see through walls! Then I heard the kitchen door close. Mom had stepped outside for some reason. Boing. Boing. Boing. Boiing. Booiing. Booiinng. Booiinngg! Okay, now I was really flying! You remember when I mentioned that mine was an iron bed? Well, this is where that fact comes into play. And FYI? If noses and iron come into contact? It took a moment for me to realize that something had happened. Because something had definitely happened. “Ahhhhhh!!! Moooooommmm!!! !” I can’t quite produce it here. Think of something high-pitched and piercing. Like an air raid siren. Mom ran into the room and wrapped her erring daughter in warm, loving, Kleenex-bearing arms. My little nose was shattered at the point of contact. The bridge. I sported two very black eyes and a sore snout for many, many days. I’d like to say I learned my lesson. And I did. Sort of. After my wounds had healed, and when Mom wasn’t looking, I still jumped on the bed. But I hung onto the iron headboard. That way, it couldn’t leap out at me unexpectedly. I’m happy to report that today, over 54 years later, I no longer jump on beds. The ceiling is simply too close for comfort. But I do jump on trampolines. Oddly enough, whenever I do, my nose hurts. Labels: And so does Mom. For five years, I worked in a bookstore. For a writing/reading addict like myself, the most perfect of jobs. In the years I worked there, I don’t think I brought home a single paycheck. Does that reflect badly on me? I know Husby shook his head more than a few times . . .
My duties at the store consisted of (in no particular order): de-boxing, labelling and shelving, organizing, entertaining children, making new flannel dust cloths, receiving, ordering, cleaning the bathroom, decorating the window, answering the phones, smiling till my dimple showed, cashier, and security. And it was all fun! But, sometimes, despite my best efforts, I made mistakes. The store had just gotten new phones. Units that clipped to your belt. Okay, I’m notorious for leaving the phone wherever I happen to be when I finish a call. AND we had just gotten in a shipment of new books. My duties were clear. De-box, apply price labels and shelve. Oh, and collapse the boxes and haul them to the dumpster out back. Then, the phone rang. Main console. I reached for the unit that was clipped to my belt. That should have been clipped to my belt. That was not clipped to my belt. Panic did not ensue. I'm stronger than that. That was reserved for AFTER I had done a complete and fruitless circuit of the store. I carefully retraced all of my steps. I had been to that shelf. And that one. And that one. And that . . .
Oh. Let’s face it, I had been to. Every. Single. Shelf. In. The. Store. The only other place I had been to was the dumpster. By this time, the phone had long since quit ringing. I had my co-worker dial again, from her phone. While I stood out beside the dumpster. Yep. The garbage was ringing. I’m sure I don’t have to describe to you what happened next. The agitation of said garbage as I swam through, looking for one little phone. The up close and personal interactions that should never be up close and personal. Then the having to stay at work for six hours after my little diving experience. All part of the job . . .
Once a week, Delores of Under the Porch Light, issues a challenge. Six little words. Use them or abuse them. Which did I choose? Use or abuse? Labels: I need a raise. Literally.